Have you long suspected your dog has emotional problems, or worry your pet iguana needs Prozac? 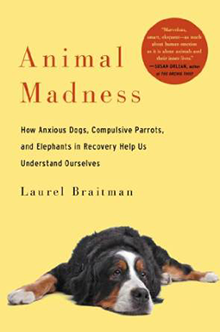 You’re not alone: author Laurel Braitman’s experience with her beloved Bernese Mountain dog led her to extensively research the topic of “animal madness” and found that it led her to new ways to look at human mental illness. Animal Madness has received several accolades, including being chosen as a Discover magazine top summer read.